One of the most exciting new features in After Effects is the integration of Cinema 4D using the CINEWARE plug-in and a free version of Cinema 4D Lite. Both provide a wide assortment of new 3D tools and options that are difficult or nearly impossible to achieve in After Effects alone. 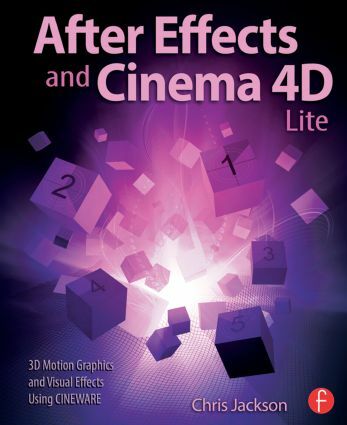 This book clearly demonstrates how the new 3D workflow bridges the two applications together to raise the design bar for motion graphics and broadcast design. Additional online materials include project files and videos showcasing the techniques covered in the book. To access these materials, please see the 'eResources' tab. What is CINEMA 4D Lite and CINEWARE? Chris Jackson is an author, designer, and professor at the Rochester Institute of Technology (RIT). He lectures and conducts workshops relating to interaction design and motion graphics, and his professional work has received over 25 distinguished national and international awards for online communication. He continues to publish and present his research and professional work at Adobe MAX Creativity Conference, ACM SIGGRAPH, and the Society for Technical Communication (STC). Chris is also the author of Flash + After Effects, Second Edition (Focal Press, 2010), Flash Cinematic Techniques (Focal Press, 2010), and co-author of Flash 3D: Animation, Interactivity, and Games (Focal Press 2006).